Phil Hay & Sons Review - Thumbs Up! Well folks it has been a while since my last post. My SkyBall review seems to be helping a lot of folks not waste their money on that useless toy and instead save the $15 dollars for something else. Let’s fast forward to today, my then 6 year old is now almost 9 and his love of sports and outdoors has not wavered in the slightest. We recently moved to a new house in the country with a swamp in the back yard. My plan was to build a personal oasis filled with tiki hut and firepit, the focal point of it all being a gorgeous pond. I worked with all the local authorities to basically rebuild an existing pond and dam that the seller had broken. I decided early on to try and do this in the most affordable way possible. I called the family friend with and excavating company, he gave me a fair price and away he went. Built my pond in 9 days. Made the shape an interesting and acceptable position in the yard, stuck a pipe in the drain and away we went. A few rains later and we actually had something. Snagged some fish from a local friends pond an my pond was complete…or so I thought. In much the same way that a sports team is great when they are winning, and when they lose all the problems bubble to the top. In the world of ponds, everything is great when the rain keeps coming, but when it stops..look out! I quickly realized that my friend excavator had no idea how to build a pond, and instead was very good at just digging a hole. I decided to make a second mistake and enlist another family friend excavator (I know, I know) who charged me a mortgage payment just to dig some little holes, fill them in and leave me high and dry, LITERALLY! Finally I decided to trust my instincts and my love for Google searches to find a replacement. I stumbled on Western Pa pond builder Phil Hay and Sons Excavating. I dropped them an email through the web form and was having a real conversation with Drew in a few days. He literally told me that his days are filled with my exact story and he was there to help. This is not a shameless plug, the guys really care about what they are doing. If a man of his word wasn’t enough, and it is for me, I asked around. Turns out two different local friends of mine were using or had used Phil Hay and Sons for pond work themselves. I cannot recommend Drew and his pond building expert gang enough. They have transformed my money pit in the back yard into the beginnings of my personal oasis. Improved the property value for the entire area and did it all with a smile and handshake. 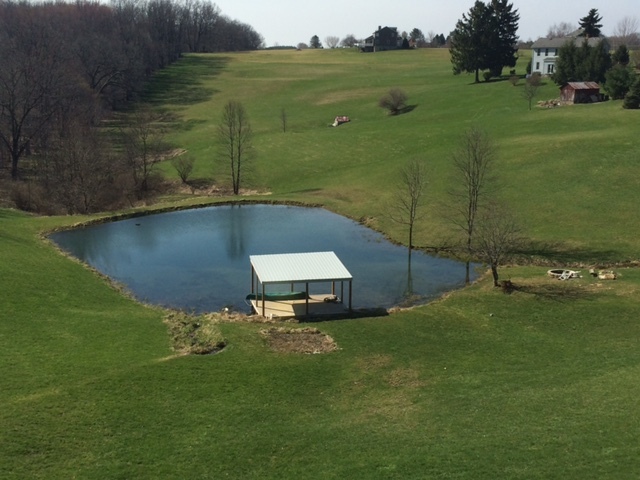 These guys use and I quote “old farmboy” methods to build and fix ponds, and it works. They are so good they are listed with Pond Boss magazine as a resource as well. Here is the contact info, if you are in Pa or Ohio and need or want work done, I’d give them a call I wish I had originally.